I recently lost my very loved giant Flemish/Norwegian mix rabbit of 2 plus years. I got a new kitten a couple of weeks ago to become friends with my rabbit. They adored each other. Up until recently, my rabbit (who lived indoors) seemed to be very healthy. What I can't seem to get past is what exactly happened? I am more than heart broken. The day before he died I noticed he had very sticky boogers blocking his nose so naturally I picked them for him. He also had runny gooping eyes. He had never in the 2 years I had him had this problem. He seemed very lethargic as well. I cleaned his pen and put him away for the night hoping that he'd make it thru the weekend so I could take him to see the vet on Monday. The next morning I woke up to check on him; he was dead!!! Stiff and with his eyes open. Absolutely horrifying for me (still). What happened? Was it from the kitten? She had used his litterbox once when I didn't notice until I found her feces in his cage. I immediately cleaned it out. Was he poisoned from it? He also had started eating her food, and I've read that it can be too much protein especially for something that isn't supposed to eat meat!! So sorry for the death of your rabbit! I hope you will find the courage to obtain another Flemish or Flemish cross; I am confident that barring any calamities, it should actually be expected to live longer than 5 years. I cannot tell you exactly why the rabbit died with certainty, but I can tell you what it sounds like to me. Your description sounds exactly like Pasteurellosis that went quickly to pneumonia, which is what killed your rabbit. Don't know if it will help, but it is well known that the vast majority of rabbits carry P. multocida, the germ causing Pasteurellosis, in their respiratory systems naturally, without exhibiting any symptoms. In the case of your rabbit, something triggered a failure of the immune system, enabling the germs to overwhelm the rabbit's health and life. I don't know if your rabbit would have gotten sick sooner or later, or whether the arrival of the kitten had something to do with the onset of disease. The timing of the onset of symptoms is indeed suspicious, since the rabbit came down with the grave respiratory infection just 2 weeks after the arrival of the kitten. It is indeed true that the rabbit should not eat cat food, and exposure to cat droppings can't be ideal for a rabbit, but whether or not these situations contributed to the death of the rabbit...I'm just not certain. Plenty of rabbits and cats share living quarters across the nation without sickening the other species. Perhaps your vet could shed more light on probabilities than I can. If any rabbit owners or breeders have had similar experiences and can shed more light on this situation, please do! Comments for Sudden death - what was the actual cause? I am devastated over the loss of my 4.5 year-old Flemish buck. He was fine the night before and when I went to go check on him in the morning he was laying on his tummy all sprawled out like he does when we was lightly sleeping. We pulled him out and he twitched some then let out a little air as I held his head. I don’t know what happened and this is completely unexpected as he was very healthy when I put him to bed. We had just finished building a cage in the garage for winter, gave her a heat lamp and a thick bedding layer of straw. She had been in there for about a week or 2 now. My wife gave her some pellet food this am and then a couple carrots for mid day snack. 3-4 hours later I went to see her and she was gone, laying on her side and non responsive. My wife said she was up and moving around today, no signs of distress but the carrots were nibbled on but almost whole. Don't have a clue why this could have happened. Any suggestions?? I would like to try again for our kids and I really enjoyed her. Sorry for her death! It isn't possible for me to know what happened from way over here, but if I had to guess, I'd say possibly a sudden gastroenteritis. When the intestinal flora balance becomes upset with pathogenic bacteria, the toxins can kill the rabbit before any symptoms, such as diarrhea, appear, or within 12-24 hours. Yes, I hope you will not be afraid to try again with another rabbit of the breed of your choice. 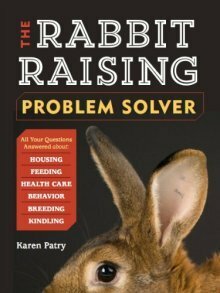 Rabbit Raising Problem Solver has a huge section on rabbit health and diseases and would be a great resource for future rabbit health challenges. My giant Flemish died suddenly 3 days ago. I have no idea what happened either because he had No symptoms. The night before he was lethargic and withdrawn. I petted him and thought if he was not better I would take him to vet in morning. I got up at 5 am and he was cold and stiff and dead. I am heartbroken as well. He also like yours had begun to eat my cat's dry food the days before. He never did that in the 5 years I had him. Cat food has in it ingredients that do not suit an herbivore's digestive system, and which could have impacted the digestive bacteria in its hindgut. A precipitating factor could have been your rabbit's age and size - large rabbits age faster than little ones, though I don't think 5 years is all that old (I don't know its actual age at death). As they age, their immune systems tend to weaken, reducing the ability of the rabbit to overcome an assault on their health. I guess the moral of the story is that cat food is not meant for rabbits, and to find a way to keep the rabbit and the cat food separated. So sorry for the loss! In time, I hope you will find yourself another Flemish Giant - wonderful rabbits they are.